Everyone believes Cyril deserves to suffer for his crimes... except The revolution has come and gone, with Amberlough City striving to rebuild itself from the ashes. The Ospies have been ousted, and the very face of the nation has been changed in the process. To ask other readers questions about Amnesty, please sign up. Received an Advanced Reader Copy from Netgalley in exchange for an open and honest review. Reading this makes me wish I had my hair up, lipstick on, and double martini in hand while classy music plays in the background. I am sitting on a leather sofa in the library with rain pattering on the bay windows which look onto the lush green grounds. I have a trust fund to support me for the rest of my days thanks to old money, just like a DePaul, but without the family trauma and loss of income due to Received an Advanced Reader Copy from Netgalley in exchange for an open and honest review. Amnesty is just as politically intriguing, and rich in atmosphere and setting as Amberlough, with a completely different flavour from both that first book, and Armistice. 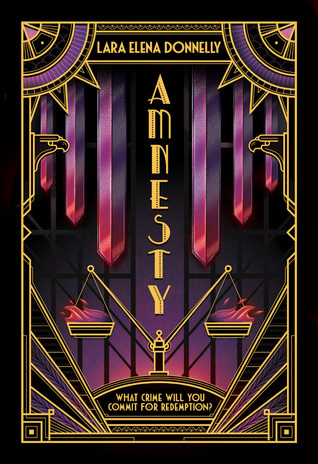 Whereas Amberlough was glitzy with the feel of vintage burlesque theatres and a dark taste of the underworld, and Armistice was warm and fast paced with its focus on character interactions and an old Hollywood atmosphere, Amnesty is darker and colder. I am a fan of these different tones, as they match the feel of the rise and fall of an age. In the beginning: whispers and panic, the middle: money money money in some pockets with chaos on the rise, and finally the end: sit-down dinners, contracts and steel conclusions (with a few explosions thrown in the mix). This series is kind of the Adult version of if The Hunger Games, Six of Crows, and The Great Gatsby had a child, and that child became entangled in espionage. Well. This trilogy is now over. I must say that after finishing this book I am feeling rather underwhelmed. This book has some heart warming and and heart breaking moments. Revalations and reunions that were long sort after. But I also felt like the author played it safe. The stakes didn't seem as high and they should of, considering the circumstances. The characters were fantastic as ever and the audio narrator makes this series what it is. Couldn't help but smile at the last line. Give this se Well. This trilogy is now over. (view spoiler)[ I still rased back home each night to read this book as though I didn't know what was going to happen! I re-read Amnesty for the second time so I could savour it more. I felt like the last time I read I rushed through needing to know if there was a happy ever after, but on the second reading, I knew we were okay. Still had all the magic, suspense and heartbreak. I was still doodling Cyril, Aristide and Lilian's names on my notebook at work, I am besotted with these characters. Aristide's perspective as always broke me. His stubborn nature and his true devotion to Cyril made me speed read this novel to see the outcome. This book had me up till 2 am biting my fingernails and begging these characters to just be happy! As Always Donnelly does a terrific job of making us extremely annoyed and absolutely besotted by her characters. The last few chapters tie all loose ends and this is the ending I was always hoping for. Having read these novels sporadically during release, I would love to sit down and re-read them one after the other. I really want to re-delve into this world as I feel I will always want more from the Amberlough Dossier. Aaaaaaggghhh I love it and need more how can it be done noooo aaagghhh whyyyyy. You can see the full review on my dumb blog here. Just as Armistice begins with a three-year time jump after the events of Amberlough, Amnesty does the same, only this time, it’s five years after the events of Aaaaaaggghhh I love it and need more how can it be done noooo aaagghhh whyyyyy. Speaking of which, I'm still waiting on a complete map of the world of Amberlough. The maps in the first two books don't include Porachis or Liso. Where are they??? I need to know! OOO LA LAAAA! THIS COVER IS FORKIN' GORGEOUS!! A satisfying end to a fantastic series. Can't wait for five years to pass so that I can drag together enough emotional resilience to survive reading all three back-to-back! The characters, and their relationships, are what I loved the most about this novel. I missed (view spoiler)[ Cordelia, but I respected why she wasn't in this book. It felt a bit sudden, but from Aristide and Lillian's perspecti Thank you to netgalley and Tor for the e-arc! First things first: I didn't even read the cover copy before embarking on my reading here, and I think that served me well. This novel starts several (?) years after the previous volume ended, and the world it is set in is quite different; but th I read this book courtesy of NetGalley, in exchange for a review. I'm going to preface my review by saying that I wanted to read this book so desperately that, when it became apparent my pre-order of the physical copy would not be arriving on time.... I ordered a kindle copy so I could read it the day of release. I was that excited for it. Although the book was quite different than I anticipated, it certainly did not let me down. It's hard to think about such an amazing series coming to an end -- I truly don't know what else could hold a candle to it! This one I'm going to preface my review by saying that I wanted to read this book so desperately that, when it became apparent my pre-order of the physical copy would not be arriving on time.... I ordered a kindle copy so I could read it the day of release. I was that excited for it. Although the book was quite different than I anticipated, it certainly did not let me down. It's hard to think about such an amazing series coming to an end -- I truly don't know what else could hold a candle to it! This one could have been a four or a five, but the intense emotional investment I had in the entire story definitely tipped it into the five category. Like the predecessors, it was completely different than I had expected. Like the predecessors, this one also . I'll try to keep this spoiler light, but if you have yet to read Amnesty (or any of the others in the series!) beware that there probably will be some degree of spoilers. I have to start by saying that the writing, of course, was beautiful. Donnelly has such an amazing writing style -- it's decadent and picaresque enough to completely enmesh you in her world, while also clear and crisp enough to cut. In plot and prose alike, she does an incredible job of balancing beauty and brutality. Her style of writing and her turns of phrase feel very unique, and very well suited to a world like the one she has created. The plot of this one was not what I expected, though after reading Armistice..... I should have expected that. I generally hate long time skips, but I came to terms with it while reading Armistice when I realized that the scope of the novel couldn't be realized without them. And as much as it hurt, it truly heightened the emotional intensity of Amnesty. While this one has the same hints of glamour, intrigue, and explosiveness of the previous two, it's also a bit... different. A lot of the glitz and glamour that was so intoxicating about the first two novels is peeled away, leaving behind an intense, raw emotional core. This one follows slow simmering personal and political tensions. Like its predecessors, there's a bit of a sense of delayed take-off due to the slow build of the first third of the novel, but once it enters into full swing.... It's overwhelmingly hard to put the book down. I was haunted by Cyril's absence in the previous book, and possibly even more so by his reappearance in this one. Donnelly certainly does not go easy on her protagonists -- she knows how to back them against the wall, to make them struggle and fight for the things they want or need, to take from them... and then, in the end, to give a little bit. She does a great job of balancing victories and sacrifices, and making sure that the latter is felt even in the former. Cyril's story is painful. It's painful, of course, because of what he endured, but also painful because of his own cowardice, his terrible choices that catapulted a country into civil war and hurt many of those he loved. Aristide..... Admittedly, I could not stand Aristide in the first book, and even part of the second. He was so aggravating, both prideful and pathetic, and he drove me crazy. Over the second and especially in this one, I came to love Aristide. He's almost as much of a coward as Cyril -- Saeger is definitely correct when she says this -- but his perseverance throughout the entire series, and his particularly unique morality, certainly won me over. I spent over half the novel wondering why the hell it was even called Amnesty. I was expecting a grand gesture, a redemption arc for Cyril in the state of Gedda, some big show of patriotism through espionage, an actual pardon... I don't know what I expected. I kept flipping to the front cover, wondering what the tag line of the book could POSSIBLY allude to. This book takes such an amazing job at taking such political and public concepts such as amnesty, retribution, redemption... and making them so intimate and personal. Aristide and Cyril aren't necessarily good people, but they are certainly the heart of the story. Donnelly does such a good job of creating a story that plays out so well on a grand level, through a variety of players, that you nearly forget that Aristide and Cyril, and their... relationship, their romance, whatever you want to call it, is the beginning and the end of the story, and the reason why everything in the series has happened. In some ways, it has caused a lot of trouble, and a lot of traumas, but it's also a reason for redemption, for a certain kind of justice.... I'm not sure how else to put it. It's been both painful and satisfying to see the way the characters continue to fight for one another, the way they make dangerous, stupid, selfish, and somehow selfless choices for one another. The story ends in a kind of limbo status -- not the painful cliffhanger of the previous two, but it isn't wrapped up neatly with a bow. It's clear that the characters will still have struggles, and pain, and obstacles to overcome that don't necessarily end with the last page... yet the story still ends on a note of hope, almost like a happy ending (whatever that means, since we are essentially dealing with a series of traumatized characters and war criminals) is inevitable. I'll probably come back later and write something that is less ramble-y and makes more sense. It's very hard to let these characters go, and I am just so thankful that I pulled Amberlough off of a Barnes and Noble shelf on a whim almost six months ago. I truly look forward to whatever Donnelly tries her hand at next. This book gave me so many FEELINGS. The whole thing played out like a movie in my head and I was gripped with fear and anticipation until the very end. I have utterly adored this trilogy since AMBERLOUGH came out and though I was dreading the end, I needed it, too. Well, AMNESTY gave me everything these books have always given me, characters to die for, politics and treacheries, bombs and glitz, wordplay and yearning, and by the last page my heart was so full, I could have gasped. 4.5ish. Rated down a half star for the decision to kill a favorite character between volumes. Otherwise I think this is the best book in the series. Hilariously, I didn’t find Aristide and Cyril’s chemistry all that convincing in the first book, though I loved it nevertheless. Here though, their relationship felt more authentic than it had before. A very satisfying end to what was a good if uneven trilogy. Do not want this series to be over! Love, love, love even as it breaks my heart! Need more Amberlough stories! Satisfying ending, although i’d like to reread them all back to back because it was hard to keep some things straight. This review has been hidden because it contains spoilers. To view it, click here. Aside from the spycraft, glamour, and realistic Constructed Languages, the Amberlough Dossier books have been at their heart studies of damaged, all-too-human characters trying to make the best of bad situations. Amnesty is the perfect conclusion to the trilogy in this regard, using the weight of time (5 years since Armistice, 8 since Amberlough) to force Aristide, Cyril, Lilian, and the rest to grapple with how their past decisions, struggles, and failures have affected themselves and those the Aside from the spycraft, glamour, and realistic Constructed Languages, the Amberlough Dossier books have been at their heart studies of damaged, all-too-human characters trying to make the best of bad situations. Amnesty is the perfect conclusion to the trilogy in this regard, using the weight of time (5 years since Armistice, 8 since Amberlough) to force Aristide, Cyril, Lilian, and the rest to grapple with how their past decisions, struggles, and failures have affected themselves and those they love. I identified all too well with their their difficulty in casting aside the masks they’d created out of necessity over the years, and coming to terms with how time and circumstance changes us all. The all-singing, all-dancing Lara Elena Donnelly is the author of AMBERLOUGH, a vintage-glam spy thriller, and a graduate of the Alpha and Clarion writers’ workshops. Her work has appeared in venues including Strange Horizons, Escape Pod, Nightmare, and Uncanny (forthcoming). A veteran of small town Ohio and the Derby City, Lara now lives in Manhattan. You can also find her online at @larazontally The all-singing, all-dancing Lara Elena Donnelly is the author of AMBERLOUGH, a vintage-glam spy thriller, and a graduate of the Alpha and Clarion writers’ workshops. Her work has appeared in venues including Strange Horizons, Escape Pod, Nightmare, and Uncanny (forthcoming). A veteran of small town Ohio and the Derby City, Lara now lives in Manhattan. You can also find her online at @larazontally or laradonnelly.com.